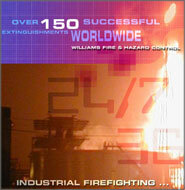 Williams Fire & Hazard Control. SENTRY POWDER EXTINGUISHERS are designed for protection of light and ordinary hazards. These extinguishers are suited for both industrial and commercial fire protection needs. Foam chemistry today is directed toward very distinct goals. Foam products are manufactured for application on various fire types and product chemistry, for environmental protections, and with application specific factors in mind. chemical attack, or the elements are a part of everyday life. That's why at Fire System Supplies, supporting and supplying unrivalled quality protection and suppression equipment is not only our business, it's our mission.